Yesterday, a direct tweet from AMD confirmed that AMD won’t be launching new Radeon series for a while since their primary focus for 2013 would remain the Radeon HD 7000 series. A Radeon roadmap has been unveiled by 4Gamer which further confirms this report and shows that AMD won’t be releasing any new card till Q4 2013. In December, we heard the first reports about the Sea Islands and Solar System series graphics card. 4Gamer did a brief interview with AMD’s Product manager, “Devon Nekechuk“. In the interview, he said that while the company would launch the Mobile Radeon HD 8000 “Solar System” series in Q2 2013 in which include the GCN based Radeon HD 8500M, 8600M and 8700M GPUs however the Radeon HD 7000 series would be here to stay in 2013. The roadmap provided shows that the Radeon HD 7000 series would remain AMD’s primary focus throughout 2013 (Q3). So this could mean either of two things, that AMD would launch the Radeon HD 8000 parts around Q4-2013 or go ahead and reveal them in early January 2014. 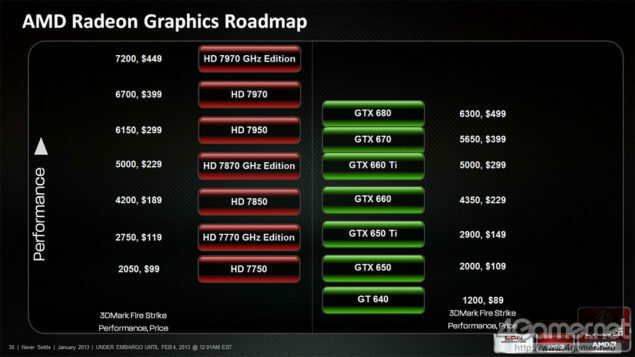 This goes for all Radeon HD 7900, 7800, 7700 series and VLIW4 rebrands of the current lineup. 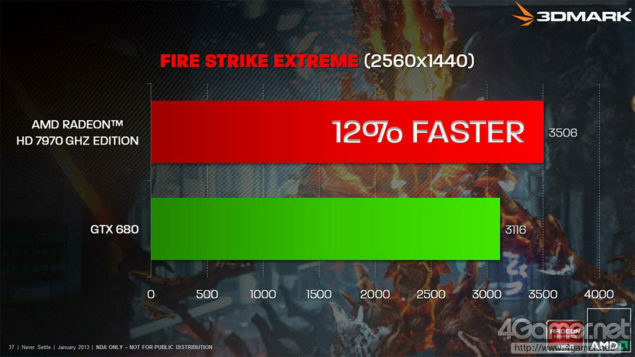 AMD in a bid to further increase their sales off the Radeon HD 7000 series have taken this move with marketing slides of the Never Settle initiative revealing that the current lineup is much faster and cheaper than the GeForce 600 series when compared in Futuremark’s 3DMark (Fire Strike) test. Devon also revealed that their company believes that the launch of the Crysis 3 Juggernaut of PC games would trigger massive sales for their Southern Islands based GPUs. Devon also said that while Radeon HD 7000 series would be here to stay, the company would focus more on refining the GPU being used in Next Generation console which are based on a 28nm architecture. However AMD won’t just leave their customers in dust till Q4 2013, the company revealed that they have major “Global Scale” plans for aggressive promotional activities in 2013, Never Settle Bundle being one of them. AMD didn’t reveal anything about it yet but they assured that more details would be posted at a later date. 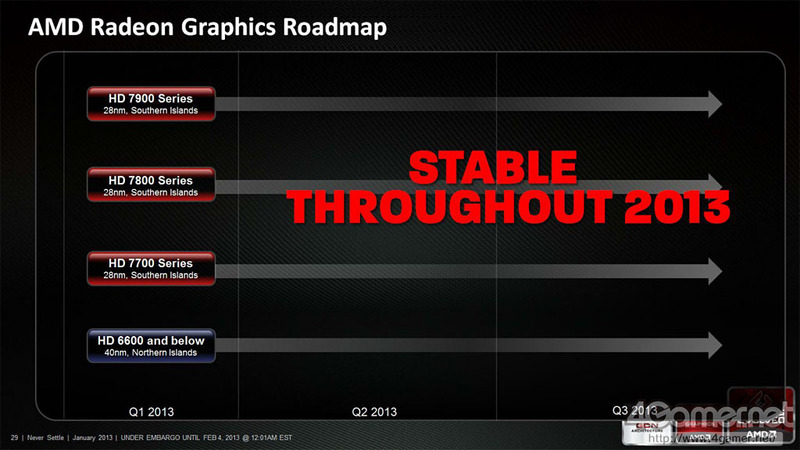 In the meanwhile we can forget about the Radeon HD 8000 series for a while until details appear around Q3-Q4 2013 mark.